Unconventional flavor profiles make for unique drinking experiences. It's weird beer time again. This week, I delve into the latest batches of cutting-edge brews from the creative minds behind Proper Brewing and 2 Row Brewing Co.'s beers. These ales have tastes and personalities all their own. 2 Row Sour IPA: Pouring a hazy amber color that turns a darker orange when held to the light, a finger-and-a-half's worth of creamy white head graces the top of the glass. The aroma starts with a medium amount of sweetness, with the hops being the first to show up as they impart a mixture of citrus rind and dank, grassy soapiness. Next, aromas of the beer's sour base become more evident, as notes of lemon rind and yogurt swell. The taste follows the nose, as it starts off with a medium amount of caramel and the arrival of the hops, creating a vaguely fruity hop flavor in the background. Stone fruits begin to emerge from there, followed by the yeast, which has a slight estery flavor with a lighter degree of medium sourness. Malt sweetness lingers near the end as the tart receptors on the tongue overcompensate for its sourness. Overall: This is a nice-tasting beer, but it doesn't exactly scream IPA. That's not a problem with this beer, but with the style. This is one of those new beer hybrids that's a true assault on the tongue. Your taste receptors get a full-on workout piecing together all of the extreme flavors as your brain weaves them into a cohesive palate experience. If you're craving something tart, I'd pursue this beer immediately as a sour satisfier and as a thirst-quencher. Proper Brett Pale No. 2: You don't see many Brettanomyces fermented beers on tap in Utah. This is due to the problematic nature of this yeast, and its tendency to linger in the draft lines, influencing the tastes of the beers that follow it. When they do pop up, it's a wonderful thing, because you know the beer-maker cares more about getting the beer out to the public than about dealing with the inevitable line sterilization after it's gone. Proper's Brett Pale Ale is on draft right now at Avenues Proper, and it's worth checking out if you happen to be brett-curious. It kinda has a tequila-sunrise-orange body—glowing red along the edges—but doesn't quite get there. You don't have to get your nose too close to the glass before you're hit with that brett yeast funk. Think barnyard scents with wildflower and horse blanket. Grapefruit pith rounds out the doughy aroma. The flavor is full, but it doesn't have nearly the same intensity as the nose, and actually leans more toward pale ale. Of course, the funk is still present, but it's much softer. Doughy malt with a drizzle of caramel lays down the base for a jammy orange-and-grapefruit hop profile. Undercurrents of brett run throughout—a little horsey up front, followed by floral notes and ends with that doughy quality. It's certainly an easy beer to put away. Overall: This beer will be hit or miss for many drinkers. Proper did a great job with it; bretted pale ales are all over the West, but most are not very well done. This one is a great example of the style. Now you have to go out and decide if this yeast-forward pale ale is right for you. These two unusual beers are both available at their respective breweries. 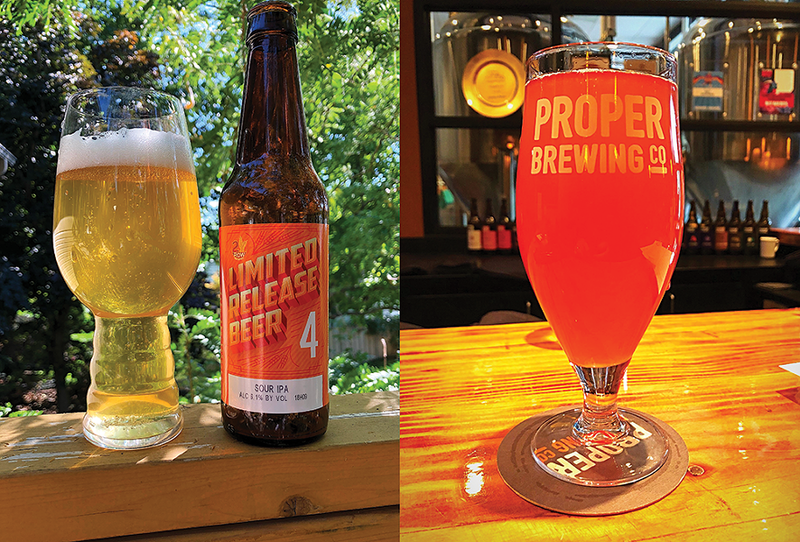 While Proper's Brett Pale Ale is exclusive to Avenues Proper Restaurant and Publik House, 2 Row's Sour IPA can be found at beer pubs along the Wasatch Front. As with all seasonal beers, only the quick will be rewarded. As always, cheers!